the statistics of chess tournaments and matches, that is a collection of chess games and the presentation, analysis, and interpretation of game related data, most common game results to determine the relative playing strength of chess playing entities, here with focus on chess engines. To apply match statistics, beside considering statistical population, it is conventional to hypothesize a statistical model describing a set of probability distributions. Common tools, ratios and figures to illustrate a tournament outcome and provide a base for its interpretation. The total number of games played by an engine in a tournament. The score is a representation of the tournament-outcome from the viewpoint of a certain engine. These two ratios depend on the strength difference between the competitors, the average strength level, the color and the drawishness of the opening book-line. Due to the second reason given, these ratios are very much influenced by the timecontrol, what is also confirmed by the published statistics of the testing orgnisations CCRL and CEGT, showing an increase of the draw rate at longer time controls. This correlation was also shown by Kirill Kryukov, who was analyzing statistics of his test-games  . The program playing white seems to be more supported by the additional level of strength. So, although one would expect with increasing draw rates the win ratio to approach 50%, in fact it is remaining about equal. The likelihood of superiority (LOS) denotes how likely it would be for two players of the same strength to reach a certain result - in other fields called a p-value, a measure of statistical significance of a departure from the null hypothesis . Doing this analysis after the tournament one has to differentiate between the case where one knows that a certain engine is either stronger or equally strong (directional or one-tailed test) or the case where one has no information of whether the other engine is stronger or weaker (non-directional or two-tailed test). The latter due to the reduced information results in larger confidence intervals. The probability of the null hypothesis being true can be calculated given the tournament outcome. In other words, how likely would it be for two players of the same strength to reach a certain result. The LOS would then be the inverse, 1 - the resulting probability. 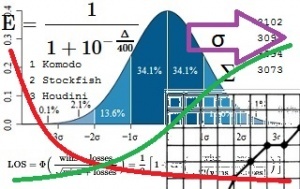 For this type of analysis the trinomial distribution, a generalization of the binomial distribution, is needed. Whilest the binomial distribution can only calculate the probability to reach a certain outcome with two possible events, the trinominal distribution can account for all three possible events (win, draw, loss). As indicated above a match between two engines is usually modeled as a sequence of independent trials taken from a trinomial distribution with probabilities (win_ratio,draw_ratio,loss_ratio). This model is appropriate for a match with randomly selected opening positions and randomly assigned colors (to maintain fairness). However one may show that under reasonable elo models the trinomial model is not correct in case games are played in pairs with reversed colors (as is commonly the case) and unbalanced opening positions are used. This was also empirically observed by Kai Laskos  . He noted that the statistical predictions of the trinomial model do not match reality very well in the case of paired games. In particular he observed that for some data sets the variance of the match score as predicted by the trinomial model greatly exceeds the variance as calculated by the jackknife estimator. The jackknife estimator is a non-parametric estimator, so it does not depend on any particular statistical model. It appears the mismatch may even occur for balanced opening positions, an effect which can only be explained by the existence of correlations between paired games - something not considered by any elo model. For further discussion on the potential use of unbalanced opening positions in engine testing see the posting by Kai Laskos  . and the returned hypothesis is accepted.